Officers and members of the 30,000-member Chicago Teachers Union continued presentations and discussions of the proposed union contract at Kelly High School on the city's southwest side after school on Wednesday, September 26, 2012. About 200 union members, a few of whom brought their children, were present during the third of the five scheduled discussions, which began at 4:30 p.m. and continued for almost two hours. The September 26 discussion was chaired by union Vice President Jesse Sharkey and Financial Secretary Kristine Mayle. 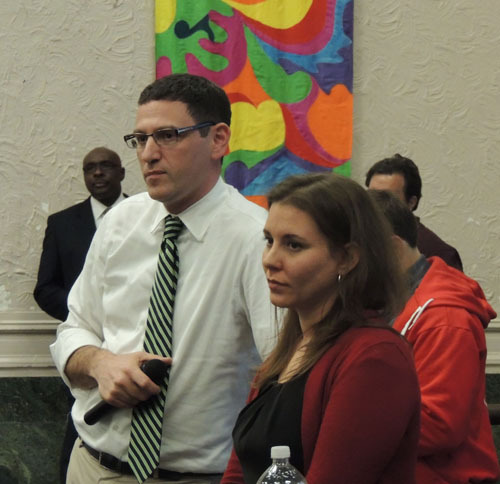 Chicago Teachers Union Vice President Jesse Sharkey (left) and Financial Secretary Kristine Mayle (right) listen to a question from a union member during the discussion of the proposed contract at Kelly High School on September 26, 2012. The contract will be voted on by the union's 26,000 active duty members in a citywide referendum in all the schools on October 2, 2012. Substance photo by George N. Schmidt.The purposes of the afternoon meetings, which began on September 24, was to answer questions from union members across the city as the members prepare to vote on the proposed agreement. The House of Delegates suspended the seven-day strike which had shut down the nation's third largest school system at a meeting on the afternoon of September 18. The officers have been answering questions on the terms of the complex agreement across the city, and the Kelly High School event continued that process. Questions ranged from very specific questions about the terms of the agreement as it will affect certain groups within the union to overall questions involving the strategy that brought the union out on strike for seven days in the first CTU strike in a quarter century. The union has published more than a dozen documents on line at the union's website (www.ctunet.com) regarding the contract. These include summaries of the various aspects of the contract as they apply to difference categories of the members to overviews. Discussions in the schools have been taking place for more than a year, when the union established "Contract Action Committees" at all of the city's more than 600 real public schools in preparation for the contract negotiations. Some of the questions at the Kelly High School meeting bordered on hostile, with union members asking why the negotiating team didn't secure higher raises to why the contract referendum was being held when it was. In their answers, the officers reminded the members that the Board of Education and the city's rulers were preparing to force the union into a lengthy strike and then to use major media (such as the current Rahm Emanuel ads on TV) to attack the union. The decision to accept the terms that were brought to the delegates was based on an assessment of how much more could be won by striking for much longer. Most of the questions dealt with specifics about how the contract was going to impact the union's members in the city's elementary and high schools as it is implemented (assuming it passes on October 2). 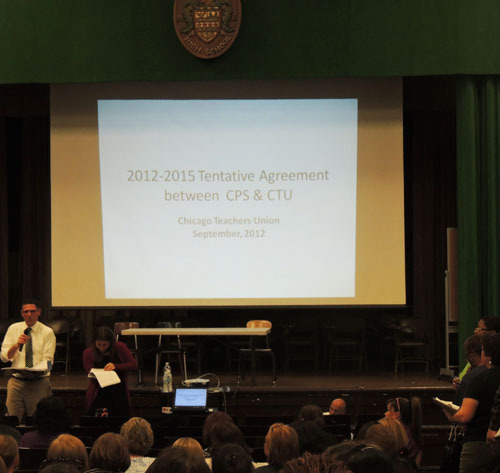 The Kelly High School meeting, which was attended by nearly 200 CTU members, included an overhead presentation on the highlights of the proposed contract. Above, CTU Vice President Jesse Sharkey (left in white shirt) answers a question while Kristine Mayle checks on a specific point in the proposed contract. Substance photo by George N. Schmidt.One of the most important unanswered questions involves the consolidation of the school year. For several years, Chicago expanded what was called the "Year Round Calendar" (or "Track E") schools. These schools, which reached more than 200 by the current school year, begin classes in early August and have different break schedules form the Regular ("Track R") schools. Under the contract, the school system will return to a unified calendar. The officers pointed out that the specifics of the consolidations were still being worked out with the Board of Education, but that they would be completed by June 2013. Because of the complexity of the "Track E" and "Track R" realities across Chicago, the officers pointed out, they could not yet tell the members when the schools would make up the seven days that were lost to regular instruction during the strike. Under the terms of the agreement, all of the days that the union members were on strike will be made up. By 5:30 p.m., the crowd at Kelly High School was about 200 people, and the lines at microphones to ask questions about the contract grew. Above, Daisy Sharp (Holmes Elementary School) asks a question of Jesse Sharkey while Mark Ochoa waits at the microphone on the left to ask another question. Substance photo by George N. Schmidt.Another issue that loomed during the contract negotiations and the strike was discussed. This involves the "raiding" of CTU members by another union, Local 73 of the Service Employees International Union (SEIU), which represented security and custodial workers, and a number of school workers who serve special education children. For several years, the Board of Education has been reclassifying teacher assistants (who are represented by the CTU) as "Special Education Classroom Assistants" (SECAs) who are represented by SEIU Local 73. The officers pointed out that the reclassification is current in arbitration, and that new language clarifies what will happen in the future. SEIU Local 73 agreed to its own contract a month before the CTU strike, and SEIU Local 73 members crossed the CTU picket lines during the strike. My room, thermometer in hand, has reached 95 degrees in June. No air-conditioning. The additional time for high school works out to be an additional 5 days that we work for free. The additional 10 days added to the school calendar, well, you get the point. The lack of a moratorium on school closings. The additional charter schools surrounding existing regular schools that are working extremely hard to provide the best education and atmosphere for our kids. And you want me to vote YES on this contract? We could have won this war. Instead we tread water, barely able to breathe, we just don't know it yet. But don't worry, Rahm will remind us all, soon enough. Just right after we vote yes on this contract. After reading the contract, yes every page, I truly beleive this is the best deal we could get in this economy. There are lots of little things that are huge. For example, preschool teachers will now get a sub when their assistant is absent. If you've ever tried to manage 20 3 & 4 year olds by yourself, especially at the beginning of the year when they are adjusting and crying you'd understand what a huge gain this is! The calendar days were already added, prior to the strike as was the longer school day. Thank the parents for getting the day to a more reasonable 7 hours. This was only one battle in the fight for public education. We have a long way to go. Our energy needs to be focused on the future incuding getting an elected school board, smaller class sizes, etc. Some of these battles have to be fought in Springfield because laws need to change. The anti-bullying clause in the contract is gigantic! So many teachers have been screamed at in staff meetings, reprimanded, even yelled it in front of other staff, parents and students, and written up for ridiculous things. Ending the suspensions is another huge win. It doesn't benefit the students if their teacher is suspended. There is an equitable grievance team, grievances will be handled quickly and fairly. Something that has not happened in the past. The PPC has more input on what is going on in the school. We have an increased amount for supplies we purchase with our own money. There is improvement for special education, para professionals, counselors, nurses, psychologists, speech pathologists and social workers. Keeping steps and lanes, eliminating merit pay and student test scores for counting only 30% of teacher evaluation is huge. We need to continue to fight charter schools and school closings. This contract is not the end but the beginning. As more facts come out about who is pushing these agendas we will have more support as we move forward. Everyone needs to educate themselves and their parents about what is happening and who good candidates and why. If the Alderman has done nothing for the schools, vote him out. By: Anthony Smith NOT a NBCT just a regular teacher. Bashing the union leadership, I did not do here, but I am okay with it if it happens, as it is part of our democratic process. I believe we can agree to disagree, as I did with some of my colleagues as we were on strike. Our energy levels, desire, passion, and level of commitment obviously varied as did our concerns and what we wanted to accomplish. I was more concerned about the level of commitment of our colleagues. Some dropped off the map on the following Monday, day 6. I have no idea what I would do with 20 3 and 4 year olds. I could say the same about 32 teens between the age of 14 and 21. Staying out longer: as a product of the public school system in Chicago since the age of 5 in 1967 I have seen plenty of strikes from the other side. I also realized the importance of Unions and strikes in 1980 when I was about to graduate and teachers went on strike. I supported them. And I was in my first year of teaching in CPS in 1987 when we went out on strike, our longest one to date. I thought I'd be fired, no tenure, and I desperately needed the money. I went out on strike anyway, proudly. WE have never had the support of the public, ever, for any length of time. Of course public support would turn against us over time. Had we stayed out even 2-3 more days President Obama would have had to take a public stance on this issue. CNN and MSNBC were finally asking where the President was on this issue and why was he so silent? There is no way the President could have avoided the questions. The heat was turning up. Does President Obama support Charter schools and Corporate 1% America or does he support the Middle Class, Working Class, Poor, and Unions, i.e., the 99%???? We will never hear the answer to this important question because we capitulated just a tad bit too soon. And it would have been a definitive turn around for Unions as I believe the President, although liking the middle ground and being nuanced in his responses, would have weighed in on the side of the 99%! And that would have set in motion a slow down of charters by our local and state Democratic leaders regarding Charters. So what is the message from the Democratic Party Leadership regarding Charters vs Public Schools? Please, if you know, tell me. Now, watch carefully, it will be full steam ahead regarding Charters. And that will DOOM our Union over the next 10-15 years, if that. For those of my younger colleagues who said we could go back to the classroom and still reject the contract, they apparently don't follow politics very closely, nor history. Once we went back in to the classroom there is no way, even if we reject this contract, which I highly doubt the membership will do, we could go back out on strike. It just would not work. The momentum is lost. For those who argue that we can stand up to school closings I ask them to review past efforts. The hand picked Chicago Board of Education (by Mayor Rahm Emanuel) texts, reads, talks on their cell phones, sleeps, and pretty much does everything else but listen to and communicate with parents, students, community reps. and teacher/union members at their meetings. They can and they do IGNORE us. And when we protest at the schools they are going to close, they don't listen to any of us then either. So if you think that we can protest our way out of school closings, well, I wish you the best in that regard and hope you succeed. But our history here has shown that that is a very uphill battle, one that could have been helped by having our President take a side, take a stand regarding the issue of Public Education in America for our future. Drones who spout what business leaders want them to know and say, not thinking critically for themselves but being obedient wage slaves. And the children will learn to speak for and vote for the political leaders who back the charter schools their business friends own. That is our future in a nutshell. Then again, perhaps President Obama has already spoken volumes without saying anything at all: he placed Arne Duncan in charge of all of our schools, chose Rahm Emanuel as his Chief of Staff, and chose Bill Daley as his Chief of Staff. And, as we all know, actions speak louder than words. I am still voting NO.